Above the Machtah Kesefappears the date, in ancient Hebrew letters taken from the coinage of the First Rebellion (65-70 CE); "Shin Samech" standing for "Shanah 'Samech Alef" (61st Year). As we have no custom of dating our coinage by foreign calenders, nor even from Creation, we took the example of our predecessors and dated our ceremonial coin from the Liberation of the Land of Israel. 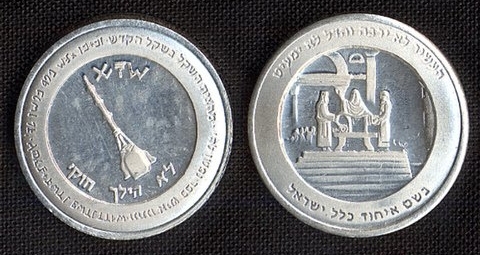 This year's coin, minted to be given on Purim of 2009, will open the 61st Year celebrations of the State of Israel. Below the Machtah Kesef appear the words "Lo Heilech Chuki" (Not Legal Tender), to satisfy the needs of the Bank of Israel Law that we are not producing a currency substitute. The same wording appears in the ancient Hebrew script as the legend along the left side of the coin. We did this as a continuation of our ancestors' custom of retaining the ancient script on our independent coinage, even after that script has been superceded by another version, as was the case with the First and Second Rebellion coins. The King of Israel reading the Torah before all the nation at the Hakhel ceremony on Sukkoth following the Shmitah year based on a painting by the Temple Institute. "And Moshe commanded them, saying, At the end of every seven years, in the time of the year of release, in the Feast of Tabernacles, when all Israel is come to appear before the Lord thy G-d in the place which He shall choose, thou shalt read this Torah before all Israel in their hearing. Gather the people together, men and women, and children, and thy stranger that is within thy gates, that they may hear, and that they may learn, and fear the Lord your G-d, and observe to do all the words of this Torah: and that their children, who have not known anything, may hear, and learn to fear the Lord your G-d, as long as you live in the land whither you go over the Jordan to possess it."